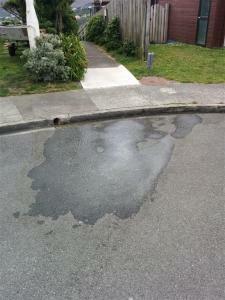 For the last couple of weeks there has been a persistent wet patch at the end of Orchy Cres. that has not dried despite enough sun and wind to do so. It has been there long enough to exclude that it is caused by rain, a leaking vehicle, washing a vehicle or from the nearby drain. During the last couple of week the site has been visited a few times and progressive work done. With the road and gutter now dry, the cause of the leak appears to be fixed.